Renewable energy is one of the hottest topics today, and one of the main priorities of the country. That’s why Stirling Energy Systems, Inc. of Phoenix recently signed an agreement to construct a massive, 4,500-acre solar generating station in Southern California. The power station will be the world’s largest solar facility, capable of producing more electricity than all other U.S. solar projects combined. In fact, enough clean power to serve 278,000 homes for an entire year. Since the plan calls for solar collectors that track the sun continuously, Stirling Energy Systems (SES) worked with Joyce/Dayton on the design of prototype Ball Screw ComDrives to meet the accurate position requirements. With over 30 years of knowledge and expertise as the leading supplier of screw jacks used in the satellite tracking industry, Joyce/Dayton was the logical choice for jacks that are designed to handle the constant motion and harsh operating environments. Since the solar dish is continuously tracking the sun, longevity of the elevation (screw jack) drive is critical to Stirling Energy. Joyce® Ball Screw ComDrives were chosen in part because their tapered roller thrust bearings are positioned directly above and below the bronze worm gear. This industry unique design provides proper gear support and alignment during the frequent tracking movements and ensures optimal worm gear life. Extreme temperatures and swirling dust near the dish necessitate customized protection against the environment. Joyce was able to meet this challenge with aluminized fiberglass bellows manufactured by Joyce/Dayton’s subsidiary. IBC Bellows were used because of their ability to protect the lifting screw from wind born debris while withstanding temperatures to 550ºF. Sun tracking is accomplished through azimuth and elevation (screw jack, shown in white) drives that require a high degree of accuracy and durability. 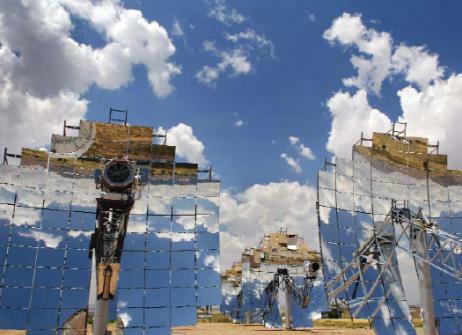 During tracking, the SES dish technology converts thermal energy to electricity by using a mirror array to focus the sun’s rays on the receiver end of a Stirling engine, which heats and expands hydrogen gas. The pressure created by the expanding gas drives a piston, crank shaft, and drive shaft that turns a small electricity generator. The entire energy conversion process takes place within a canister the size of an oil barrel. Why Joyce Ball Screw ComDRIVEs? Cost – The Joyce ComDrive® is a self-contained actuator that combines the ball screw jack and worm gear reducer into a single compact package. The ComDrive style reduces the overall design and build cost since it eliminates the need for a coupling and gear reducer mounting plate. Service & Custom Design – Joyce/Dayton has worked closely with Stirling Energy Systems and their engineers over the past several years to design and develop a Ball Screw Jack that meets or exceeds Stirling’s specific application requirements. This includes designing an industry first 10 ton ball screw jack with a 2” diameter lifting screw. Efficiency & Life – Joyce’s high lead low friction ball screws provide optimal efficiency and the industry unique tapered roller bearing arrangement ensures optimal worm gear life. Reliability – All Joyce Ball Screw Jacks come equipped with a steel coil mounted inside the ball nut. This steel coil will support the ball screw if the ball nut is damaged. Since 1873, the Joyce/Dayton Corp., with headquarters based in Dayton, Ohio, has been the premier manufacturer of heavy-duty screw jacks for lifting and positioning equipment. Whether you’re processing aluminum, handling spent nuclear fuel or loading cruise ships, Joyce/Dayton has handled the toughest applications imaginable. With unmatched design and manufacturing expertise, Joyce provides solutions that are productive, enduring and cost-effective. For more information, contact Joyce/Dayton.